Personal supplies carried on the man in this operation are worthy of record; they consisted of one A3 emergency ration, which was the standard issue in a flat tin, one 02 ration, which was a fairly large tin containing three meals each packed in greaseproof wrapping, one 100 gram tin of "solid fuel", one water sterilising outfit, a 80 millilitre bottle of insect repellent lotion, and a tin containing 28 tablets of atebrin (anti-malarial drug). The roles of the two squadrons were given in their respective operation orders. A Squadron's was the role of the 21st Infantry Brigade, on the right flank, to secure a beachhead; to, advance and capture a specified area from the sector of coast known as Green Beach to certain points about a one and a half kilometres inland; to be prepared to advance east along the line of Vasey Highway and capture Sepinggang Airfield. 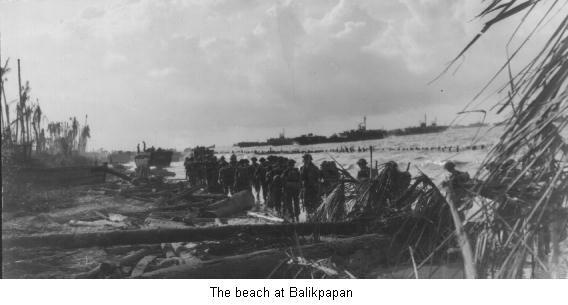 B Squadron was to support the 18th Brigade (landing on a two-battalion front on Red and Yellow Beaches) in the assault on and capture of Balikpapan. This town, noted for its extensive oil refineries and adjacent oilfields, had been heavily fortified by the enemy, but for 15 days prior to F-Day it had been subjected to an intensive bombardment by Allied naval and air forces. 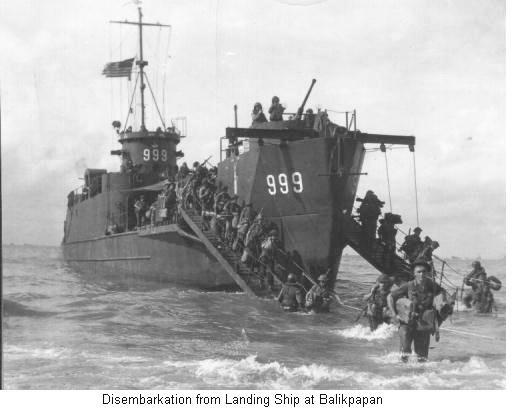 Broadly, this was the regiment's part in the Balikpapan operation: Regimental Tactical Headquarters and A and B Squadrons landed on F-Day in support of the assault brigades; subsequently portion of B Squadron was placed in support of the 25th Infantry Brigade; on F-plus-3 Day Regimental Headquarters tanks landed at Balikpapan and C Squadron, at Morotai, came under command of 7th Division; the main body of the C Squadron Group and the regimental rear party landed at Balikpapan on F-plus-13 Day; there were no actual operations against the enemy by the unit after F-plus-18 Day, July 19, and the regimental group was concentrated in a camp at Petersham junction. C Squadron was not committed to operations at all during this campaign. At 0900 on 1 July the initial wave landed on a 1,900 metre front on the continuous beaches facing the Strait of Macassar. Lack of opposition and a scene of utter desolation signified the success of the pre-invasion bombardment. Rocket barrages had literally flattened the beachhead area and a huge column of smoke poured from the blazing oil tanks on a feature known as Tank Plateau. The tank reconnaissance parties landed with the initial waves of infantry and five minutes later the first tanks of A Squadron were ashore; in all 33 tanks and two D8 tractors were landed on F-Day without mishap, the tanks including three frog, three dozer tanks and one Covenanter bridgelaver of the 2/1st Armoured Brigade Reconnaissance Squadron. In all cases in the initial landing the waterproofing of the tanks proved most satisfactory and the intake of water was negligible. In most cases the waterproofing was blown off on the beach. Enemy offshore obstacles had been demolished and the wade through a metre of light surf was accomplished with ease. However, bomb craters and debris caused difficulties and minor delays at the beach exits. Portions of the initial wave actually went ashore to the left (west) of their objectives; thus, portion of A Squadron landed on Yellow Beach instead of on Green, and in B Squadron 4 Troop landed on Red Beach instead of an Yellow. This had the effect of putting the creek, Klandasan Ketjil, between 4 Troop and the assembly area of the battalion it was supporting, the 2/12th, but fortunately there was an intact bridge a short distance from the beach and the troop used this. Engineers found a number of 250 kilo naval and land mines laid, which caused diversions by the tanks from the planned routes to the assembly areas. On F-Day A Squadron landed 1, 2, and 3 Troops, one tank of Squadron Fighting Headquarters and a dozer tank by 09:25, while 4 Troop and the remaining two tanks of Fighting Headquarters landed at 21:00 and spent the night on the beach. The 2/27th Battalion had the task of securing a perimeter of 800 metres and other elements were to pass through and secure a extensive area. The country here was well timbered. The scarcity of opposition and poor tank "going" in this sector restricted A Squadron's beachhead operations to minor advances and blasting of suspected positions. No 1 Troop at 11:00 moved forward to assist C Company of the 2/27th to clear a building in the vicinity of Pump Road and at 12:00 2 Troop moved to support the 2/16th Battalion in clearing Hobson's Road until the tanks were held up by a wrecked bridge. Next morning 1 Troop was in action again in support of C Company of the 2/27th, clearing the area of enemy until finally held up by the Klandasan Besar which was impassable. On 3 July the 2/14th Battalion on the right flank of the invasion was moving towards the airstrip at Manggar, and the 2/27th was consolidating on the Sepinggang airstrip. A Squadron had no operations on this day, but the squadron leader, Captain Curnming, took a party on a reconnaissance of the Sepinggang airstrip with a view to landing tanks to support the 2/27th in an attack on the Lady Schofield feature. Subsequently this proposed attack was cancelled because the enemy were found to have evacuated this feature during the night of 3-4 July, and the rapid advance of the 21st Brigade to the Manggar Besar River by 4 July was carried out without tank support, whilst A Squadron was held back at the assembly area hoping for action. On 4 July at 03:00 a small party of Japs attacked 1 Troop of A Squadron, which was then in the vicinity of Pump Road and Vasey Highway about one and a half kilometres east of the landing point; the Japs were using spears but inflicted no casualties and were repulsed. On this day the tanks of 5 Troop and regimental headquarters were landed in the afternoon; regimental headquarters were set up near the 7th Division's headquarters on a feature known as Rupture, about a kilometre from the beach. The opportunity for action for A Squadron came when the 2/14th Battalion, crossing the Manggar Besar River on to an airstrip some sixteen kilometres east of the F-Day landing point, was subjected to heavy fire from the low hills to the northeast of the airstrip and ta ' nk support was summoned. A reconnaissance party from the squadron went forward and after it had found that it would not be possible to bridge the Manggar Besar by means of the Covenanter it was decided to land tanks on the north bank of the river. On the following day, 5 July, 3 and 4 Troops embarked on an L.C.M. and an L.C.T. and at 13:00, 3 Troop, landing near the Manggar Besar under cover of smoke laid by the artillery, moved off the beach to be de-waterproofed in readiness for action, while 4 Troop remained at sea on call. At 13:45 the area came under heavy mortar fire, following which a 120 mm naval gun opened up at a range of some 1,200 metres. 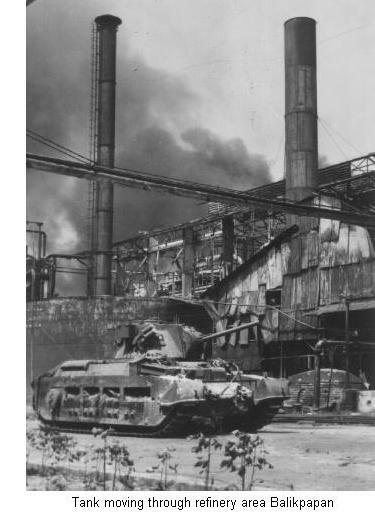 All three tanks were hit, two of them "brewing up" and becoming total losses, while the third was recovered next day. During the shelling six crew members were wounded: Sergeant D. W. A. Twine, Corporal R. J. Blackberry, Troopers W. Cunynghame, D. L. Dalziell, H. Matthews, A. Pope. No. 4 Troop on the L.C.T. was ordered back to Balikpapan. The 120 mm. gun which had shelled the tanks so successfully was in a very strong emplacement on the side of a hill. During the night of 5-6 July a 25-pounder gun of the 2/5th Field Regiment was moved forward to within about 800 metres of it and at first light opened a bombardment which destroyed it. The fight for the Manggar airstrip continued grimly until the 9th but although 4 Troop of A Squadron was held in readiness, tank support in this area was not called for again and A Squadron had no further operations. No. 4 Troop returned from the Manggar Besar to the assembly area on 17 July. On 9 July Captain Watson and Lieutenant McLean had rejoined the squadron. Whereas it was the fortune of A Squadron to have but little fighting, with some tank crews not once realising their ambition to go into action, B Squadron fared differently as all of its troops were committed at some time or another. 13:30 3 Troop (Lieutenant B. S. Johnston) relieved 5 Troop in support of C Company, leading the advance along Humphries Road towards Parramatta Ridge, and later was in turn relieved by 1 Troop. The move along the ridge was made with the tanks in line ahead as the ground fell away sharply on both sides from the road along the top, and in any event a fairly commanding view to right and left could be had from the road. A frog accompanied the troop and after tank gunfire had blasted open bunker positions the frog sent jets of flame into the openings. The capture of Parramatta Ridge was completed by about 14:20. At nightfall 1 Troop, two tanks of 3 Troop and a frog tank formed a perimeter with the 2/10th. At 16:00 4 Troop (Lieutenant D. H. Ballard) supported A Company of the 2/12th in an advance of about 900 metres up Valley Road, which ran north from the beachhead, for an attack on Potts Hill. The troop opened fire with the Besas on possible enemy positions but did not succeed in drawing fire, and systematically pounded tunnel entrances and other likely positions with the 2-pounders. It provided smoke to cover the withdrawal of a platoon to rejoin the company, and infantry casualties were evacuated on the louvres at the rear of the tanks. Then, due to the anti-tank ditches dug by the enemy and the boggy nature of the ground, the three tanks were unfortunately bogged. Despite feverish efforts they could not be got out by nightfall and as they were about 150 metres apart and the infantry could not provide perimeter defence for them they had to be locked and left for the night, while the crews dug in within the infantry perimeter some 200 metres away. Vickers guns were sited to cover the tanks and there were roving patrols, but nevertheless a Jap raiding party was able to get close enough to throw a type of bomb that did superficial damage to external fittings, including the destruction of the wireless aerials. At 17:00 Hill 87 was subjected to bombing and strafing by friendly aircraft; it was understood that this was intended as direct air support in accordance with plan but was being delivered an hour later than scheduled. During this a tank of 5 Troop was superficially damaged by rockets and unfortunately three other ranks, who were outside the tank when it was hit, were wounded: Corporal C. L. Mauger, Troopers T. E. Edwards and L. J. Kerz. 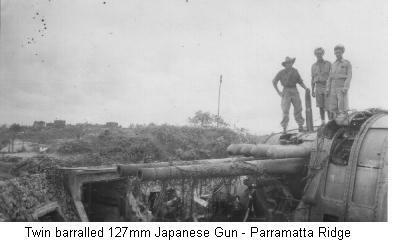 Then two tanks of the troop and a frog tank helped the 2/9th Battalion to clear Santosa Barracks and capture Santosa Hill. After this action Lieutenant Rossiter, on advising the infantry commander that the tanks were bogged outside the perimeter, was somewhat stunned by the reply, "That's all right, old man I've finished with them." 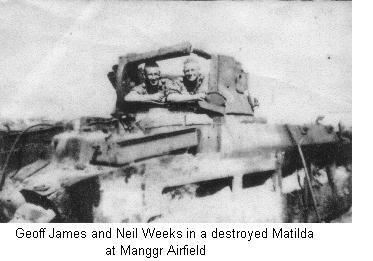 During the day it had been found that the Matilda dozer tanks of the reconnaissance squadron were unsatisfactory in that role and that the only equipment which could be useful to bogged tanks was the D8 tractor. With the first day's experience of number of tanks having been bogged at vital stages, it was decided by the squadron leader, Major Ford, that he needed more gun tanks in reserve, and a successful request was made to Brigadier Chilton for permission to drop the dozer blades from these tanks. In the morning a stray mortar shell landed in the B Squadron headquarters area at Red Beach, causing six casualties Trooper K. Broome was killed; Corporal A. E. Playford an Troopers R. A. Richardson and W. H. Burton were wounded and all three died of their wounds later; Corporal R. B. Gun and an engineer of the 2/4th Field Company were wounded. The D8 tractor which was attached to B Squadron for recovery work was in constant use during the early stages of the operations. As many as seven tanks were bogged at the same time and on different fronts. For the first four days it was necessary for the D8 to work 24 hours a day to maintain tanks in action. With the beachhead secure the 18th Brigade thrust north-west towards the port area with the 2/10th Battalion and northward along Valley Road with the 2/12th. A reconnaissance to find a possible tank route from Parramatta Ridge to Soepoelch Hill was unsuccessful. However, the battered cracking plant on Tank Plateau was captured by the 2/10th Battalion with the support of 1 Troop. Meanwhile there were still Japanese occupying the tunnels leading into the hills near the Santosa Barracks and two tanks of 5 Troop and a frog tank supported the 2/9th in mopping up by directing gunfire and flame into the tunnel entrances. Later this troop was assisting A Company to clear tunnels and bunkers near the coast below Santosa Hill and to advance along Vasey Highway until finally the tanks were held up by an oil fire across the road. The Battle description continues under the description of the �Milford Highway� Battle Honour.